A. Brian Wallace for reviewing prior to publication. Cave Rock sits on the southeastern shore of Lake Tahoe in Nevada, and is a spiritual and cultural center for the Washoe, who call it Da ow ga, or “the lake.” The simple name indicates how fundamental this site is to Washoe culture: it is a place of such spiritual power that only trained Washoe medicine men are permitted to go there and women are not allowed to look at it. The 360-foot high, 800-foot wide dome is the gathering place of me’tsunge or water babies, small beings that possess medicinal knowledge and power that they bestow on medicine men. The Washoe’s traditional subsistence cycle took them to Lake Tahoe in the summer for hunting, fishing, and collecting medicinal plants, roots, and berries, into the Pine Nut Mountains to gather pine nuts, a staple food source, in the fall, and to the valleys of the Eastern Sierras in the winter and spring. The Lake Tahoe Basin—10,000 sq miles of land surrounding the lake—was originally Washoe territory, but a massive land grab pushed them out in the late 19th-century. White Americans first came en masse to Washoe country in 1859 when silver was discovered in Virginia City. The loss of habitat and territory was astonishingly fast: by 1863, the Washoe had been completely driven off their land, and forests had been clear-cut to feed the construction boom. The Washoe moved east and northeast of Lake Tahoe into areas around Reno, Carson Valley, and Gardnerville. They maintained ties to their land through journeys to the Basin for seeds, medicinal roots, and reeds for basket-making. Some found jobs in the developing Lake Tahoe area as domestics, laborers and game guides for vacationers, employment that allowed them to return to their land, albeit through a far different lifestyle. Washoe claims to their traditional land have been repeatedly trivialized by the federal government, starting with a ruling in 1866 by the Superintendent for Indian Affairs that there was no good location nor need for a reservation for the Washoe because their population was rapidly diminishing. The destruction of Cave Rock, in particular, began with blasts of dynamite used to create two highway tunnels running through its center in 1931 and 1957. In the last few decades, recreation has been the main activity drawing non-Natives to Cave Rock, including hiking, picnicking, fishing, and stargazing. For nearly two decades, the area’s year-round good weather and Cave Rock’s climbing difficulty level have attracted sport climbers from all over the world. Recreational use burgeoned in the 1990s due to the construction of a boat ramp in 1993 and the rapid creation of new climbing routes. Forty-six different climbing routes, facilitated by hundreds of bolts and other devices put in place by climbers, crisscross Cave Rock. Many routes are inside the culturally-sensitive cave-face, where climbers have constructed a dirt, stone and gravel floor. Climbers have cemented over important cave openings and marked surfaces with graffiti. None of these alterations in the physical structure of Cave Rock were approved by the Forest Service. Nearby, the highway that cuts through the rock sends cars whizzing beneath the climbers. While the Washoe oppose any recreational activities on their sacred ground, climbing is particularly disturbing because of the direct physical contact climbers have with the rock, allowing them to absorb spiritual power they are not trained to use. Permanent climbing hardware affects the Rock’s physical integrity, while the presence of climbers and their gear undermines its spiritual integrity. For years, the Washoe sought to ban all sport climbing at Cave Rock. The Forest Service, which controls the area as part of its Lake Tahoe Basin Management Unit, attempted to mediate between the Washoe and the sport climbers, who are represented by the Access Fund. The nonprofit Access Fund is supported by contributions from rock climbers, and by corporate sponsors in the recreation industry, including REI, Clif Bar, The North Face and Backpacker Magazine. It has also filed briefs on behalf of climbers in cases concerning climbing at Devils Tower National Monument in Wyoming. The Access Fund proposed that the Forest Service model its Cave Rock policy after the Park Service’s “voluntary” ban on climbing at Devils Tower during the crucial month of June, the month of ceremony for the Lakota. A long and difficult Environmental Impact Statement process resulted in a Forest Service Record of Decision in July 2003 that banned all rock climbing as well as off-road motorized vehicle use at Cave Rock. The Forest Service determined that rock climbing would pose an adverse effect to the National Register eligibility of Cave Rock. 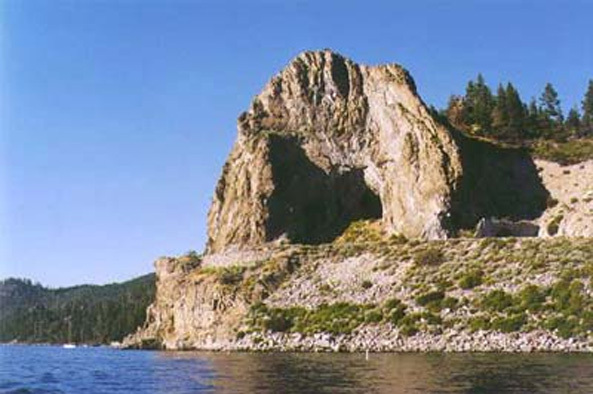 (Cave Rock was found eligible for designation as a Traditional Cultural Property on the Department of Interior’s National Register of Historic Places in 1996 due to its paleo-environmental and archeological resources, its role as a historic transportation corridor covering over a century of transportation development, and as a vital historic resource in the story of the Washoe People at Lake Tahoe.) The Record of Decision required the removal of all existing climbing bolts, masonry flooring, and graffiti. The Forest Service’s management plan is designed to “protect the Cave Rock heritage resource and regular uses there in a manner that, consistent with mandates and restrictions of law and regulations, preserves the historic and cultural characteristics that make the property eligible for listing on the National Register [of Historic Places].” While this ruling is a step in the right direction, the Washoe Tribe points out that the Forest Service’s decision is not based on tribal rights to practice their tradition, but rather on National Register historic status, and that the management plan still allows other activities such as hiking and picnicking that adversely impact traditional cultural uses of the area. The Access Fund appealed the conclusion of the management plan, but the Forest Service upheld it in December 2003. Fearing that the ruling would set a precedent for other climbing sites on public land, the Access Fund immediately filed a federal lawsuit alleging that the climbing ban violated the establishment of religion clause of the First Amendment. A Federal District Court dismissed the action in January 2005. In a 9th Circuit Court of Appeals ruling in August 2007, a three-judge panel ruled that the Forest Service’s climbing ban was constitutional because the Forest Service is protecting Cave Rock as an archaeological, cultural, and historical national resource, not because it is sacred to the Washoe. The judges noted that the Forest Service allows other activities that are incompatible with Washoe spiritual practices, in spite of Washoe complaints—and that this fact proves the Forest Service is not favoring Washoe religious practices, as the Access Fund claimed. It is merely protecting the physical integrity of Cave Rock for the use of visitors, both Washoe and others. So while the ban on climbing represents success in the protection of Cave Rock, the legal reasoning used to arrive at this verdict is not a ringing endorsement of sacred land protection. The Access Fund has not announced any further legal action, so as of this writing, Cave Rock is safe from climbing, though other recreational uses around it continue. While the Forest Service supervises museum exhibits and archaeological sites dedicated to Washoe culture, the contemporary Washoe are still separated from their land. The tribe continues to lobby for the return of some of its traditional land base around Lake Tahoe. The 9th Circuit judges cited as a precedent the 2004 Cholla Ready Mix v. Civish case in which the same court endorsed the state of Arizona’s right to refuse to buy materials that were mined from Woodruff Butte, a Hopi sacred site. In that case, Judge Betty B. Fletcher wrote that “Native American sacred sites of historical value are entitled to the same protection as the many Judeo-Christian religious sites” and that protecting sacred sites served the historical interest of the nation as a whole. This reasoning, however, means that non-physically destructive land use, such as hiking around Cave Rock, are permitted. The ban on rock climbing is a significant victory, but at the same time it demonstrates that the United States still lacks legislation that understands sacred places to be the sites of ongoing worship and protection, practices that are sometimes disturbed simply by the presence of humans and activities that appear to be non-invasive. “Appeals court backs climbing ban at sacred site.” Indianz.com, August 28, 2007. Stern, Robert. “Research Report: Cave Rock, NV (Washo)(2006).” The Pluralism Project. USDA Forest Service. “Cave Rock Decision Announced.” News release, July 10, 2003. Washoe Tribe. Washoe Tribe of Nevada and California.